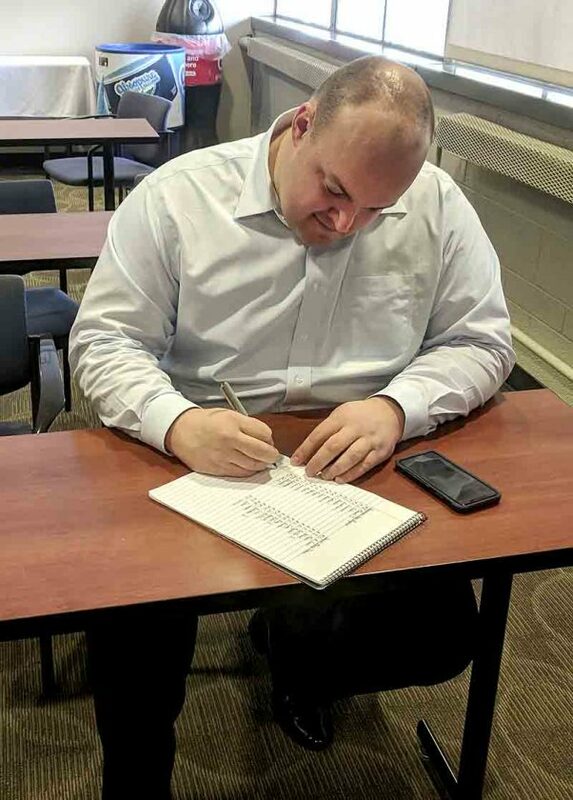 Tribune Chronicle / John Vargo Youngstown State University's Director of Basketball Operations Mark Richmond works on some last-minute details in the Detroit Mercy Titans media room prior to a Feb. 2 game at Calihan Hall. SOUTHFIELD, Mich — Matt Manley exited the hotel elevator with two sizable packed implements which his team uses for practice. His hands are rarely empty. Tommy Donadio joins him outside the bus, the two bundled up as much as they could, fighting the below-zero temperatures which plagued the Midwest in late January and early February. The two and Alex Tambellini were packing the team’s tour bus as quickly as possible. 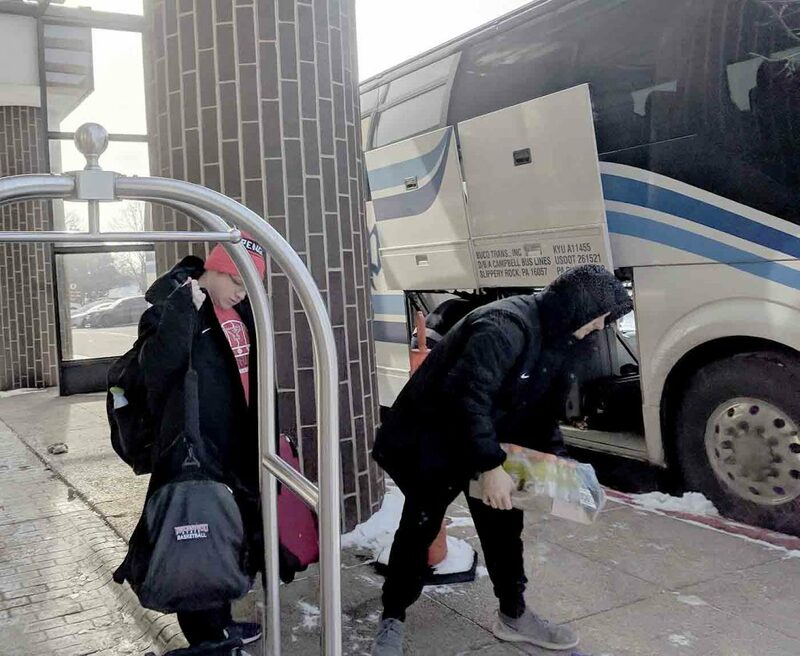 The Youngstown State University men’s basketball team was headed about a half-hour north to the Oakland campus, so not as much had to be packed as earlier that day when the team left Youngstown. Nicholas Gainor, who wasn’t on this trip, is the fourth member of the team’s staff of equipment managers. Each of the four has other duties besides loading the bus cargo container with luggage, crates of Gatorade, various snacks and other items essential for a team’s trip. Manley said they’re responsible for laundry and you’ll see them on the floor prior to games helping the team rebound during warm-ups. Are there enough basketballs on the rack for the players to shoot? Tribune Chronicle / John Vargo YSU men's basketball team managers Matt Manley, left, and Tommy Donadio pack the bus before it leaves the hotel to go to the Detroit Mercy game. “We’re always doing something. There’s not a lot of down time,” Manley said. 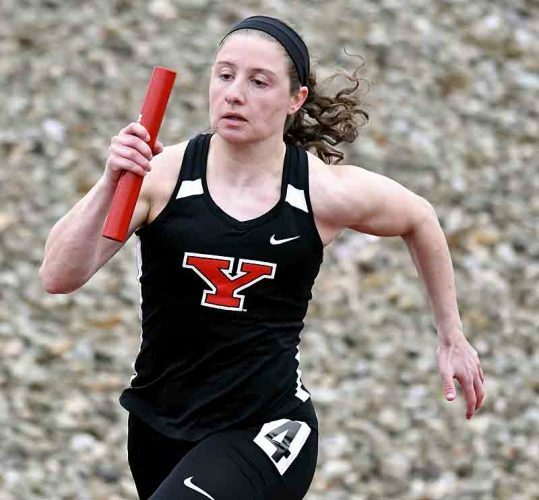 It’s not like the YSU team packs up the bus, heads to a hotel, plays a game or two and then returns to Youngstown. Penguins director of basketball operations Mark Richmond has been working on each road trip since the schedule came out a couple of months before the season. He identifies where the team wants to stay. Usually it is two different locations. The team would stay near the Oakland campus one night and in a downtown Detroit hotel for the other layover. That means arriving at a hotel following a game. This trip, the team stayed at The Westin which is a half-hour from Oakland’s campus and 15 minutes from Calihan Hall, home of Detroit Mercy. 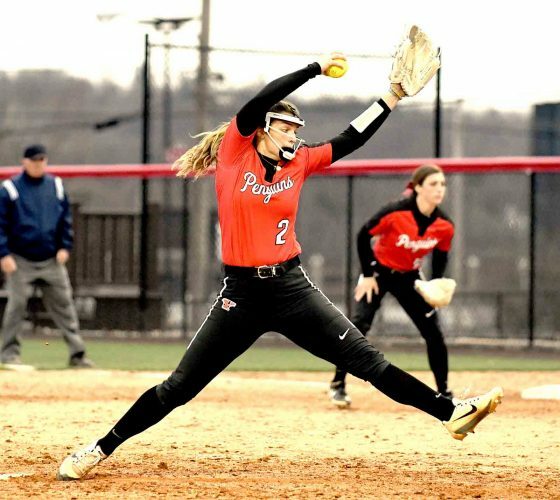 It gave the Penguins a true home base for the recent two-game Horizon League road trip. “This starts in August when the schedule comes out,” Richmond said. “You jump on it, get some good rates. There are certain places, we’ve been here a few years, we like staying. A couple we didn’t. It’s not all about the hotel. Players, coaches and other support staff have to eat. Some meals are in the hotel — a buffet-style meal to save from gathering about 30 people on a bus and heading out somewhere. Those are usually the breakfast and pregame meals. Dinner is sometimes in a restaurant near the hotel or where the shootaround is the day or night before the game. Richmond sometimes has to make adjustments. During this interview on Feb. 1, a couple of hours before the team’s shootaround at Calihan Hall, he decided it would be better for the team to have dinner at the hotel. The shootaround was at 7 p.m. and the team didn’t leave the gym until after 8. Restaurants in downtown Detroit would likely have a wait of at least 30 minutes, especially with a group like this. Richmond talked to his hotel contact for catering meals and told them of the adjustment. The meal was waiting for the team after the session at Calihan Hall. Richmond also contacts the respective opponents and tries to get some time on the opponent’s floor prior to the game. YSU was on Oakland’s floor on Jan. 30 when the Penguins arrived in Michigan and then again on game day around noon. The pregame meal was around 3 p.m., and the team arrived at the O’rena on the Oakland campus around 5:30 for the 7 p.m. game. That decision was made after a loss at Cleveland State when YSU went up the day of the game and did not have a shootaround. The team’s itinerary is made out by Richmond prior to the trip, but he does have to adjust sometimes, like dinner after the Feb. 1 shootaround. This was a bus trip, about four hours from Youngstown. Trips to Wisconsin to face Green Bay and Milwaukee are on commercial flights. “You would think they’ve done it before in the airports,” Richmond said. “Every time you walk in the airport, the baggage agent or whoever sees you. It’s like, ‘Oh my gosh.’ It’s not always easy, but you give yourself an extra half hour or so, make sure everybody gets though. The team’s budget fluctuates from trip to trip. “We map it out before the year for each trip, but it covers bus, flights, hotel and meals,” Richmond said. Richmond knows about being an equipment manager. He was one at West Virginia. That’s where he got to know YSU coach Jerrod Calhoun, who was the Mountaineers’ director of basketball operations. The two have a great working relationship. Richmond admits he’s not a great delegator, but Manley asked for more responsibility. Manley texted everyone on the bus a menu for a postgame meal after the Oakland and Detroit games. He then ordered and the meals were waiting on everyone’s seat. Manley and the other managers cleaned up as well. Richmond appreciates what they do. “These guys, it’s a thankless job,” he said. “Most people don’t know what they do and how important they are to our success. They don’t make money to work for us. That’s why we like taking them on the road, treating them right, see different parts of the world they’d never see. Donadio played basketball for Bristol High School last year. His principal knew Crestview’s superintendent Matthew Manley, Matt’s father. Matt interviewed Donadio for the job. 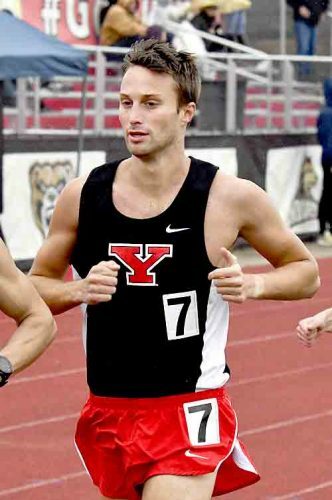 Donadio, a YSU freshman, is trying to learn from Matt. “I’m watching everything, helping Matt out. Doing the food orders with the Google Docs and everything,” Donadio said. Manley and Gainor are from West Branch, while Tambellini is from East Liverpool. 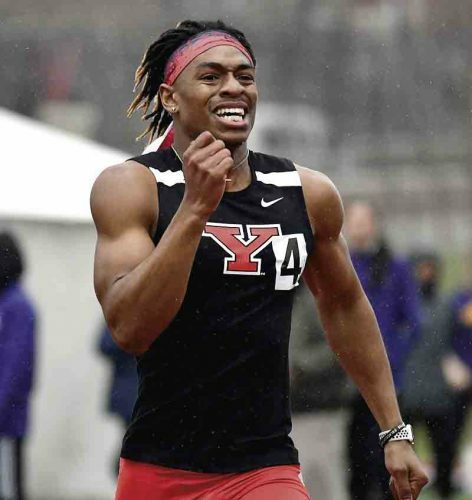 Manley’s preparation as a high school athlete had him ready to take over as YSU manager. “West Branch had two great mentors in DJ Dota (football) and Randy Montgomery (basketball),” he said. “They always expected you to work hard. If you do something wrong, keep rolling up your sleeves and work hard. That’s what we’re here to do.